Gone are the days where decisions and recommendations to retail customers are made based purely on intuition and relationships. Sales and marketing teams need to take a fact-based approach to their business, starting with developing new skills in “retail understanding”, “proficiency in data”, and “category & business insights”. A fact-based presentations approach will help you uncover development opportunities as well as combat potential weaknesses through joint business planning (JBP). Who are your Retailers and what are they trying to accomplish? What data sources are available to me and how do I analyze and interpret them? How do I create actionable recommendations for the Retailer using the tactics? Adding value to the Retailer through solutions and recommendations that tie in with their overall strategies and their biggest areas of opportunity will help move you from relationship-only selling to an added-value, more collaborative sales approach. The result? Win-win solutions for the Vendor and Retailer. But keep in mind, once sales teams answer these questions, their job is only half done. Their next step is to learn how to tell stories through compelling, fact-based presentations that connect with the opportunities and insights they have uncovered. Let’s review the most important elements of fact-based presentations. Every presentation you deliver should look professional and engage your audiences’ eyes. Don’t underestimate the power of a good looking presentation — it’s essential to providing the best possible communication experience. Start by making sure you have mastered your presentation tools — for example, PowerPoint. Your presentation needs to focus on your audience and their needs – not you and your priorities. Research your audience’s needs, limitations and opportunities prior to the presentation so you can be strategic about what you include. is specific and measurable (vs broad and intangible). 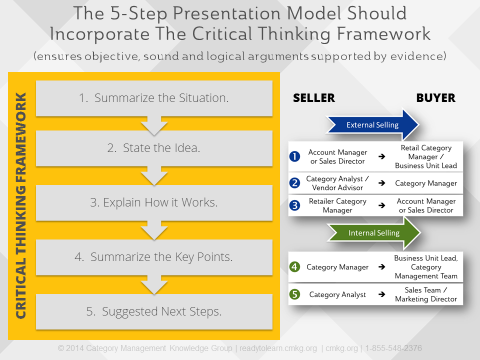 Try following a critical thinking framework when developing your fact-based presentation. It will help you create sound, objective and logical arguments that persuade your audience, resulting in meaningful conversations with your audience that often identify the optimum course of action. Data should support your purpose and help you tell a compelling story. By including relevant facts and data related to your customer’s conditions, needs, limitations and opportunities, you will show them that you understand their current situation. This establishes credibility and a common ground from which you can collaborate. For example, The Retailer’s market and category picture can be captured in a basic category overview, which then supports the purpose of the presentation that you identified in Step 3 above. 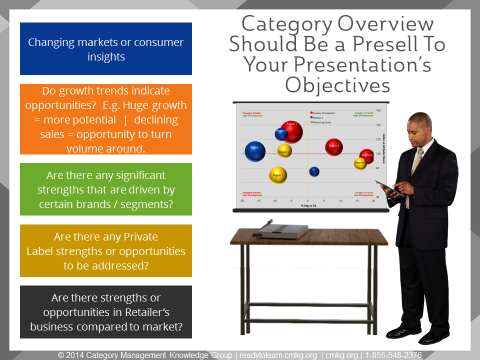 Of note, this is a category overview (not a brand overview), and it should only include the relevant market / Retailer / Shopper / consumer / competitive data that aligns to your presentation objectives. Using data can help to presell your overall presentation objectives. Practicing the delivery of your presentation, smoothing out any “bumps”, and ensuring that it considers and anticipates the objections of your audience is the last secret. Rehearsal is ABSOLUTELY KEY, and should never be shorted or skipped. Whatever type of rehearsal works best for you, it is essential to work through any glitches, errors, or bad flow. Finding these things ahead of time is ALWAYS better than discovering them in the middle of your presentation. Another opportunity is to recall past presentations you have given, and consider successes as well as areas for improvement. Identify the conclusion, premise, objection or rebuttal to your argument and consider ways that you can improve. Knowing how to develop and deliver good presentations is a critical skill for sales, marketing and category management professionals. Moving to a fact-based approach will improve the quality of your presentations, and will increase the return on data and technology investment. It will also create more collaborative relationships with your retail customers through a value-added approach to selling. Looking for ways to a more strategic, fact-based approach to your business? Category Management Knowledge Group can help you, your team or your organization learn more through a single course or a customized program. We have some great category management training options available to meet your needs. Check out our accredited course on Fact-Based Selling/Presentations (including creating compelling presentations), or watch a video preview of the course by clicking the graphic below.